Releasing library metadata for open use benefits the customers as well as libraries. What nonfiction books do the metro- politans read? The graphics show the most wanted nonfiction books according to the different categories in HelMet libraries (the city libraries of Espoo, Helsinki, Kauniainen and Vantaa) between 2.2.2007 and 23.5.2011. The data were collected by adding the amount of each title in library collections to the number of customer reservations the title had received. ave you tried to google libraries and their collections? Have you noticed that search engines don’t find library books? 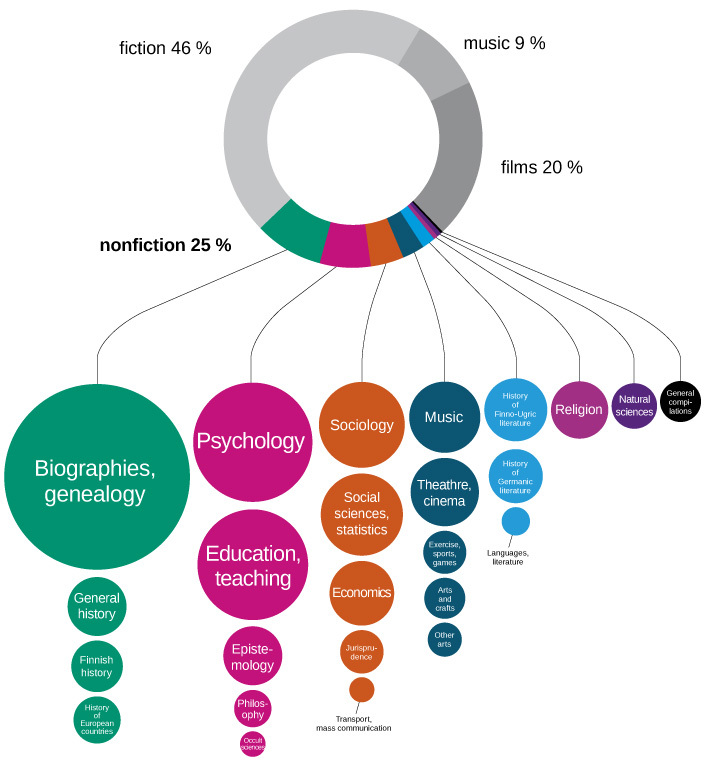 Libraries produce enormous amounts of metadata but does Google know about this? Unfortunately it doesn’t. Reasons for this are historical and linked to libraries’ information systems. In most cases, libraries could only be visited through their own specific systems. In fact, library systems actively prevent search engines from indexing library information reserves. In other words, we have consciously confined the data produced by libraries. This might be a revelation for many. The situation is indeed absurd: why would any organisation deliberately hide their services? One answer is that we have assumed that libraries are only used through our own systems. Library is not the first, nor the last institution to think like that. However, the ever expanding world of networking and linked information does not work like that. Libraries, like many other public organisations, have a great deal to learn. The changes and challenges have been drastic. Or perhaps we just have not even realised the situation. It is, nevertheless, obvious that current library system providers have realised it — for them blocking data is part of ensuring their business. But we build libraries for customers, not for system providers. It is time to break down these structures. Open data is a movement that tries to release closed, often publicly funded data sets in a machine-readable format with an open license. In the case of libraries it simply means opening libraries' metadata silos for everyone to use. What does it actually mean? Revolutionary opportunities, all of which we have not even thought about. First, with open data, libraries could build an ecosystem where libraries’ future is defined by libraries themselves, not by the systems or their providers. We could develop libraries with modern web-based techniques. We all know how important this would be. Second, embracing open data means that libraries would be part of a networking, democratic society that produces better services by combining open information. There is no reason why libraries should close their doors just because we have fumbled with non-traditional materials such as e-books. Open data provides solutions for this challenge, as well. E-collections are only one part of the package. The metadata of library materials from HelMet Library Consortium, the joint network of Helsinki Metropolitan Area Libraries, were disclosed in the summer of 2010. Since then we have annually provided data to Apps for Finland competition in which anyone can compete with ideas or applications that make use of open public data. The results have been amazing. For example, we have witnessed an Android application that is able to scan the barcode in any book in your bookshelf or in a book shop and show the location of the book in the nearest library. Last year another application visualising lending trends in HelMet libraries was among the best contenders of the whole competition. Open data enables customers to develop our libraries in a very genuine and practical way. The solution is beautiful, simple and elegant. Libraries are public organisations and, therefore, information they produce should be open. It is not only for the benefit of customers, but for the benefit of libraries, as well. Open data is the biggest opportunity for libraries in years. If we hide our data, we hide ourselves.